It is with sadness we announce the passing of our beloved one, Norma Jean Evans, 71, on Friday, November 23, 2018, at the Cape Breton Regional Hospital, Sydney, surrounded by her loving family. Born in Whitney Pier, Norma Jean was the daughter of the late John and Meltha (Neville) McCormick. Norma Jean was a member of Holy Redeemer Parish. She was a crossing guard in the Pier for many, many years, a job she truly loved. She had many friends at Crossroads, where Norma volunteered. 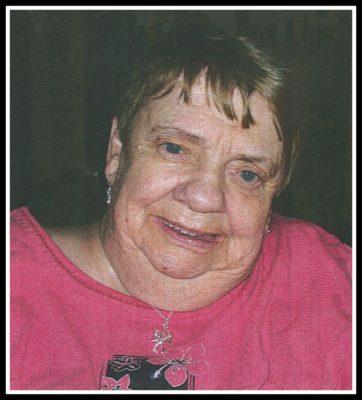 Norma Jean will be remembered by family and friends for being very caring and loving. She had a gift for making people laugh and always had a comment or come-back to anything you said. Norma Jean will be sadly missed by her sister-in-law, Liz, who has been by her side since Martin passed away two years ago. Norma Jean is survived by her son, Jamie; sister, Sheila Kerr; sister-in-law, Liz Evans, nephew, Colin and niece, Carmel. Besides her parents, Norma Jean was predeceased by her husband, Martin; brother, Joseph; sister, Mary Louise and nephew, Fraser Kerr. Memorial service to celebrate the life of Norma Jean Evans will be held at Pier Community Funeral Home, 1092 Victoria Rd. (entrance on Church Street) on Thursday, November 29, 2018, at 1 p.m. in the All Faith Chapel with Fr. Paul Murphy officiating. Light refreshments will be served in the reception area following the service. Private family interment will take place at a later date. Donations in memory of Norma Jean may be made to the MacGillivray Guest Home or the Holy Redeemer Building Fund. The family would like to thank the nurses at the Cape Breton Regional Hospital for their kindness and caring in Norma Jean’s time of need. A very special thank you to the staff at MacGillivray Guest Home. Norma Jean came to love everyone there from the nurses, maintenance and housekeeping. She knew they loved her too. Donnie and I and Tim were sad to hear about your mother’s passing. Norma was someone who always had a smile for everyone, whether it was while working as a crossing guard or just walking by on the street. She was a very special person who always took the time to ask how our cats were doing. Norma’s presence was dearly missed when she moved from Maloney Street. I hope that your happy memories of her will help you through the days ahead, until the time comes when you will all be together again. My great aunt always said: The Best is Yet to Come, and I truly believe that. Thinking of you all and keeping you in our prayers. My condolences to Norma’s family and friends. I was fortunate to meet such a nice lady. The times I visited she always had such a welcoming smile and I got to see her great sense of humour. Norma enjoyed talking about her brother and her sisters and seemed to have a sparkle in her eye when she talked about family and friends. Rest in peace Norma, I feel honoured to have met you. I was so saddened to see your Obituary in the CB Post tonight. It was just by accident that I decided to check the Pier Funeral Home, only to see your Name appear. I will never forget all the good times, we had driving around in my Volkswagon with Dear Marguerite and yourself. All those great memories are just flooding my mind right now. I am so saddened by this news. My heart is breaking because I haven’t been able to connect with you for a very long, long time. Ottawa, is far and I don’t get to CB much as I would like to. With a new Grandson arrival 5 months ago has kept me busier than usual. I am retired now. My Sincere condolences to your Family. Sorry for your loss. I have always treasured our memories of our youth with Marguerite. Say hello to Marguerite when you see her in Heaven. I will be Praying for you! I still miss your presence.